A real gem of a course set in a national park, hemmed by breathtaking mountains and forests lies Tsutsujigaoka Country Club. Located in the city of Ashikaga, which is known historically as the Eastern ‘Little Kyoto’ for its cultural, religious and architectural heritage, and more recently for it's outdoor activities, Golf courses, wineries and the area's general 'slow-life' atmosphere. Designed by Mr. Katsumi Takizawa in 1991, Tsutsujigaoka Country Club is an 18-hole, 6,670-yard par-72 offering an interesting challenge for all levels of golfer. The course layout is quite unique given the local topography; each hole winding around hills or set in valleys, at times the fairways can be narrow so a strategy needs to be applied to each hole. Play through: Possible during weekday rounds, not on weekends. An extra nine is also possible if daylight permits and recomended is the early bird tee times in summer which see 18 holes played before 9am!- a rarity in Japan. Practice facilities consist of two putting greens and a chip-on green, there are no full swing practice facilities other than the course itself. The front 9 starts at the elevated 1st tee gives a beautiful panorama of the area and frames this beautiful and short par 5, on the right of the ample fairway is a river leading into a larger body of water, which the fairway follows around making a right dog-leg. From the tee all is needed is 250 yards to set up next to the water, leaving about 210 yards to a large green, beware the second shot can be quite nerve racking particularly if the wind is up and many a players of all handicaps dreaming of easy eagles and birdies have been fooled- Including this one! A more sensible play (particularly if your drive went left of the tee) is to lay up to the side of the water for a 120 yard approach. 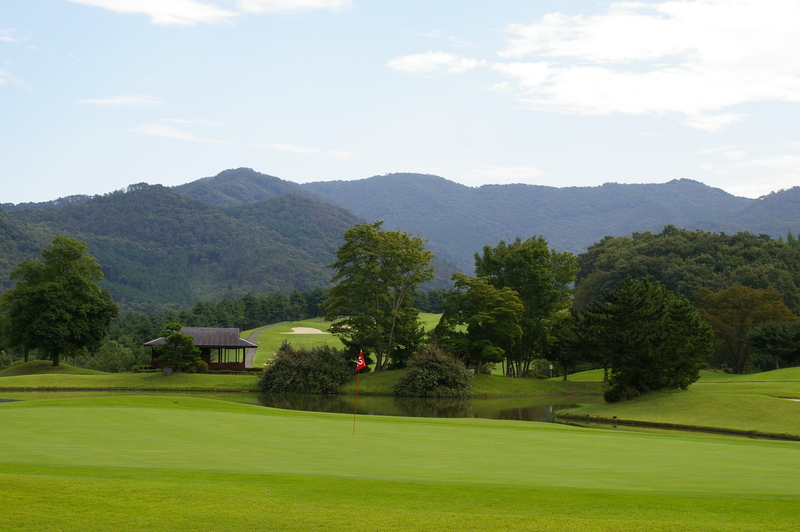 Most of the front 9 holes are hemmed by beautiful forests and mountains on all sides which gives a very private feeling, many holes with exposed crags on the mountainside high above the greens glowing in the Japanese sunshine. The greens are all quite large and receptive, not to quick- but true. The ‘Tsutsuji’ in Tsutsujigaoka means Azalea, and the club certainly lives up to that name with over 30 varieties on the course, one particular planting is over 300 years old, depending on the time of year the course will be bathed in the pinks and whites of this bloom (April-May). The Tsutsujigaoka clubhouse is quite oppulant, after a long tree lined and manacured driveway, visitors are greeted with an oppulant clubhouse, high doors and sloped roof give way to a tiled open planned reception area bursting with natural light. The colossal 4,530 m2 building has a members private lounge, relaxation center, restaurant, private rooms and outdoor garden. The mens and ladies dressing rooms have been recently refurbished and feature private showers, sauna, jet-stream baths, plunge pool, all overlooking an equisite Japanese garden. The reason Tsutsujigaoka CC has become a very popular destination is because of their Soba noodles; hand-rolled buckwheat noodles which their master chef prepares fresh everyday. People travel from far and wide just to try this- and are really worth a try!. Soba is served with a variety of choices of side dishes such as Katsu Don (Pok cutlet on rice) or Ebi Ten (Shrimp Tempura on rice), some western dishes are also available such as pasta, sandwiches and assorted starters. The main restaurant overlooks a beautiful 20m waterfall cascading down artistically placed volcanic boulders and native plantings - which are vibrant in spring and summar and rich with ambers and reds in the fall and winter. Drinks and food are quite reasonable with the average lunch set at ¥1,600 and a large draft beer at ¥750. Another nice feature of this course is they give free of charge welcome coffee in the morning, sweets during and after the round as service. At about 78KM from Tokyo, the course can be reached easily by train or car. Travel time for either is about 90 minutes from central Tokyo. Take the Tohoku expressway north bound, switch to the Kita Kanto expressway at Hinofune, remain here for 20 minutes and exit at the Oota Kiryuu inter-change. The course is 10 minutes from here. Alternitevely if you are coming from West Tokyo/Kanahawa: Take the Kanetsu expressway to Takasaki, switch to the Kita kanto and again exit at the Oota Kiryuu inter-change. From either Asakusa station (Ginza line) or Kita Senju station (Hibiya line) take the Tobu line bound for Isesaki, get off at Ashikagashi station. It is recommended to take the express train *Ryomo which is usually about 1 per hour- travel time is 50 minutes approximately and costs ¥1,700. The club operates a free pick-up service which needs to be pre-booked. From Ashikagashi station to the course takes 15 minutes. * Take note: The Ryomo express train departs from a different part of the platform where you need to pay the express fare before entering. Tsutsujigaoka Country Club and Air Golf welcomes both small and large groups and offers a variety of tours and packages as well as bespoke Japan golfing experiences. Discover your Japan Golfing experience! - On the day running- Play format/ scorecards/ results/ prizes etc.